Korea Aerospace Industries (KAI) has displayed model of FA-50 Multi Role Aircraft and KUH-1 Multi Purpose Utility Helicopter, and photo of KAI T-50TH Lead-In Fighter Trainer for Royal Thai Air Force during Defense and Security 2017 exhibition in Bangkok. Korea Aerospace Industries (KAI), Republic of Korea, said the delivery schedule for the KAI T-50TH 1st and 4th Phase to Royal Thai Air Force will be held in March 2018 and October 2019 respectively, according to the company's representatives at the Defense and Security 2017 exhibition at the Impact Exhibition Center, Muang Thong Thani, Bangkok, Thailand, 6-9 November. The Royal Thai Air Force has signed a contract to supply a range of 3,700 million baht ($ 108 million) of T-50TH Golden Eagle ($ 108 million) fighter trainer aircraft on September 17, 2015. On July 11, 2017, the Royal Thai Air Force deployed T-50TH to operate at No. 401 Squadron 4 Takhli Air Division, replacing L-39ZA/ART to be transferred to a single flock at the 411 Fighter Sqn, Wing 41, Chiang Mai. Royal Thai Air Force has ordered the supply of T-50TH fighter training aircraft 16 machines currently supplying two phases, including 12 machines. Flying on August 10, 2017. KAI South Korea has the capability to assemble the T-50TH production line for the Royal Thai Air Force. According to the delivery of the first set and the second set in March 2018 and October 2019. In addition to the introduction of T-50A T-50B TA- 50 and FA-50 on active duty in the Air Force. Currently, KAI has successfully exported advanced T-50 Golden Eagle jet trainers to many countries around the world. T-50I, Indonesian Air Force (TNI-AU: Tentara Nasional Indonesia-Angkatan Udara), 16 aircraft and eight FA-50PH (Philippine Air Force Air Force), which has been used in combat with terrorist groups. 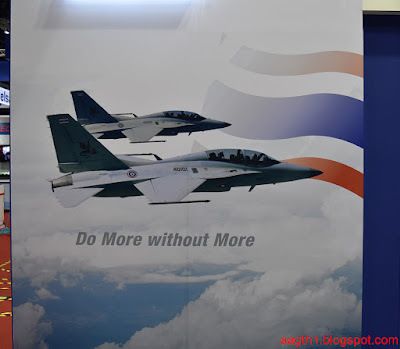 For the Royal Thai Air Force, the latest customer to receive a T-50TH fighter trainer, KAI is hoping to receive a Phase 3 contract from Thailand soon. The company is also looking at opportunities to sell more of their aircraft to Thailand and ASEAN. KUH-1 Surion helicopters are being deployed in the Republic of Korea Army and the Republic of Korea Marine Corps. Klo d upgred enak jga ni bisa setara fa50 atau ta50 ..
Dilematisnya RI...nanti kalo t-50i mo dipasang radar, pilihannya radar buatan amrik yang kategorinya sedang2 saja, atau mo pake yang paten tapi buatan israel? Ya langsung pasang Elta, ga usah gembar-gembor media. Mereka bisa kasih undisclose country buyer kok kalo kita mau. Kelompok sing iki rodo marjinal om joni....tapi yo embuh, sopo ngerti meneng2 neng kono survey kandungan bahan baku nuklir yo? Contohi negara Turki f16 mereka radar dan avionik sistem senjata sudah produk dalam negeri. Atau Jepang f16 mesin kawakasi dan kita juga ada radar dan avionik buatan dalam negeri kasih modal ke swasta untuk pengembangan jgn beli buatan luar negeri sudah pasti mereka tau kekurangan produknya. tidak ad yg produk yg sempurna.